This article is dedicated to the victims of the 2013 Boston Marathon Bombings. Aerial view of Copley Square taken from a plane in 1957. Note the entirely different layout and composition of the square and the area around it prior to the construction of the Prudential Center and John Hancock Tower. Image courtesy MIT Libraries. Copley Square, along with Government Center and the West End, is one of the parts of Boston most significantly altered by urban renewal. Since the Prudential Center Urban Redevelopment Project was implemented by City Hall in the early 1960s, the function and functionality of Copley Square have changed significantly. In the years following the groundbreaking of the project in 1960, the primary landmarks in Copley Square have gone from a massive rail yard, the old John Hancock Building and the Mechanics Building (see my article "E Branch" for more information about the Mechanics Building) to Boston's two tallest and most prominent skyscrapers, the Prudential Tower and new John Hancock Building, and the Shops at the Prudential Center. The Boston Public Library, of course, has stayed constant as a Copley Square landmark since the turn of the century. 1895 Bromley Map of Copley Square. Map courtesy Ward Maps. Already in 1895, as shown by the map above, Copley Square was a functional, well-developed urban square. The Boston Public Library's McKim Building, shown at the center of the map, had just been completed and many longstanding prominent Boston institutions, such as the Museum of Fine Arts, Boston Society of Natural History (the predecessor to the Boston Museum of Science) and the Massachusetts Institute of Technology (MIT), called Copley Square home. On the west side of Exeter Street, one can see MIT's gymnasium, and at the corner of Dartmouth Street and Huntington Avenue, the Museum of Fine Art's former main building is visible. Two majestic churches, both visible in the photo below, tower over the square. Across from the Boston Public Library on Boylston Street is Old South Church (not shown above), and at the corner of Huntington Avenue and Boylston Street, at the time an intersection, is Trinity Church. Across from each other by Exeter and Huntington are the Copley Square Hotel, which stands to this day, and Hotel Oxford, since demolished, marking Copley Square's position as a fashionable and important destination for Bostonians to spend time and for visitors to Boston to stay. Copley Square in 1909. At the far right is Old South Church, to the right of the photo is the Boston Public Library, in the center is the Museum of Fine Arts and to the left is Trinity Church. 1909 was the last year of the Museum of Fine Arts' tenure in Copley Square before moving west down Huntington Avenue to the Boston-Roxbury line across from Northeastern University and by the Back Bay Fens. Note the streetcar on the far right. Image courtesy Boston Public Library. Copley Square's prominence meant that there were several transportation investments put into the area. Even before horsecar lines began to be electrified, there were horsecar lines running through Copley Square. 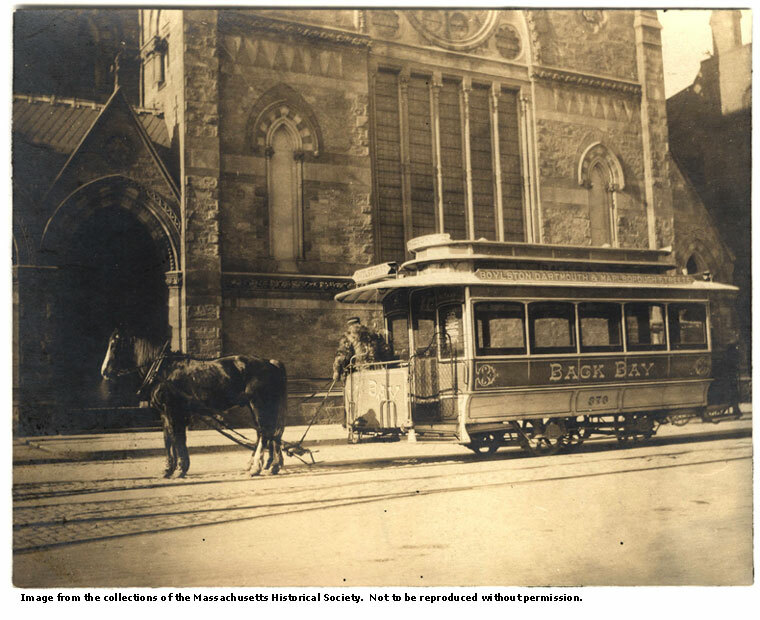 The last horsecar ever to run in Boston ran through Copley Square along a line through the Back Bay that has long since been abandoned. Last horsecar ever to run in Boston, pictured in 1900 in front of Old South Church in Copley Square. Copley Square continues to be served by electric streetcars to this day. The streetcar lines that became the A, B, C and E branches of the Green Line, as well as many other trolley lines, originally passed through Copley Square as street-running streetcars. When the Boylston Street Subway, an extension of the Tremont Street Subway further downtown, opened in 1914, the A, B and C branches moved underground and the Copley Square subway station opened (see "Subway" for more information). The E branch continued to run through Copley Square via surface streets until the Huntington Avenue Subway opened in 1941, giving the E branch access to the Boylston Street Subway and ending surface streetcar surface through Copley Square (see "E Branch" for more information on the Huntington Avenue Subway). Copley Square was also well served by passenger railroads. In 1899, the New York, New Haven and Hartford Railroad opened Back Bay Station on Dartmouth Street for the Railroad's Boston and Providence Division. Now, one could board trains from the four aforementioned major east coast cities to Boston that would bring one to the heart of Boston, Copley Square. In 1900, the Boston and Albany Railroad relocated its main station in the Copley Square-Park Square area, Columbus Avenue Station located by the corner of Columbus Avenue and Berkeley Street in Bay Village by Park Square, to Copley Square, building two separate stations—Trinity Place (westbound) and Huntington Avenue (eastbound). 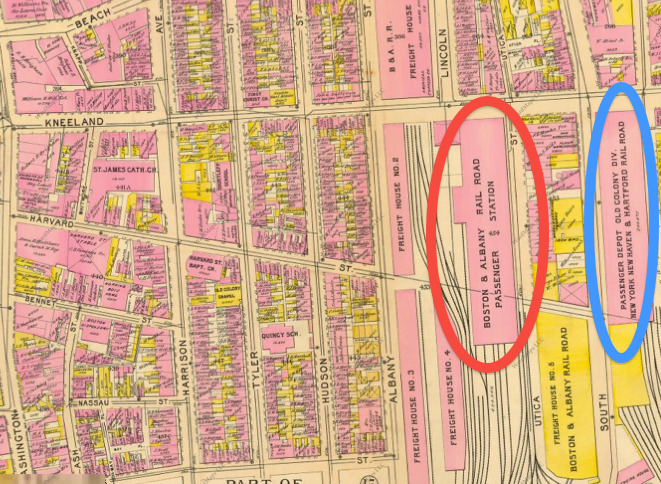 1895 Bromley map showing the former location of the B & A RR's Columbus Avenue Station, circled in blue. It is important to note that prior to the opening of Back Bay Station in Copley Square and South Station downtown, the NY, NH & H RR's Providence Division's main station in Boston, circled in red, was located in Park Square near the Public Garden, circled in green and pointed to with a green arrow, respectively. Map courtesy Ward Maps. 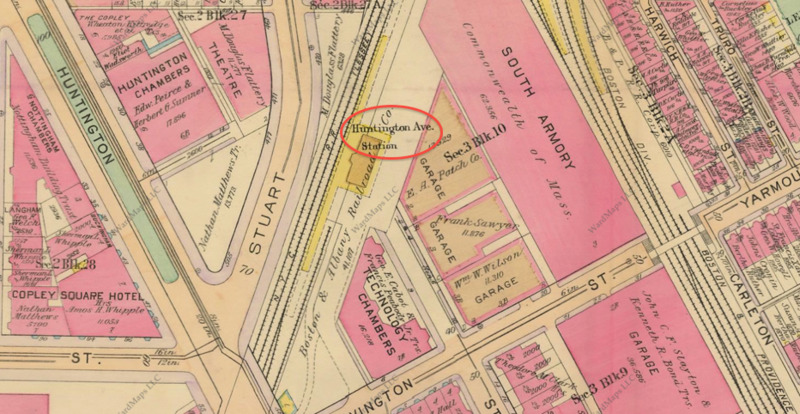 Circled in red is the Boston and Albany Railroad's old main station, located adjacent to Kneeland Street between Lincoln and Utica Streets. 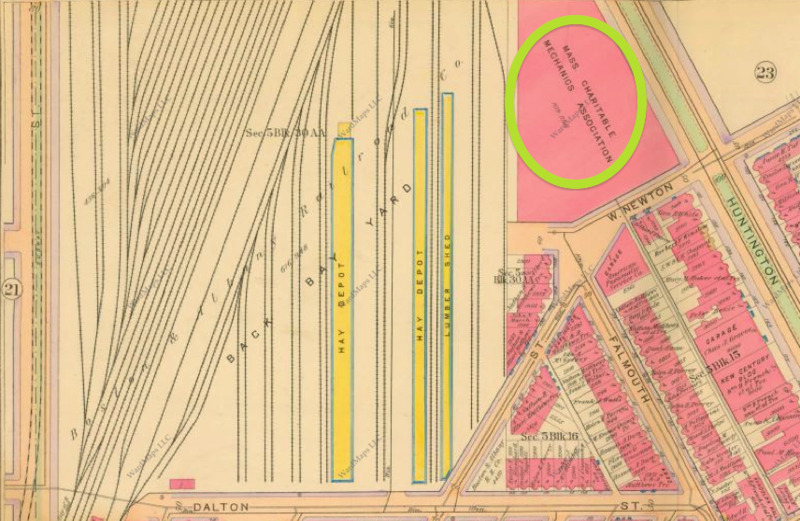 Circled in blue is the main station of the NY NH & H RR's Old Colony Division, which was also replaced by South Station. Map courtesy Ward Maps. Present state of former locations of B & A RR (circled in red) and Old Colony Division (circled in blue) main stations. 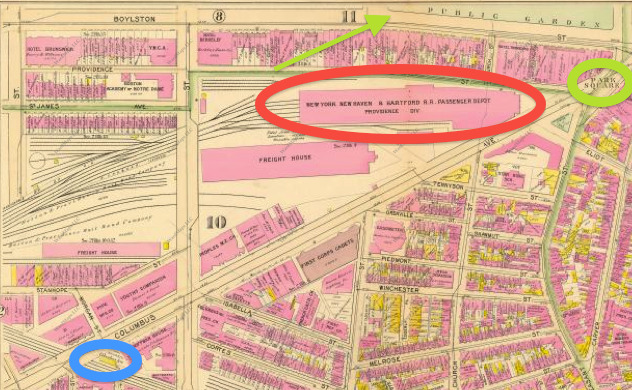 Circled in green is a flour warehouse which appears to be the only building spared from the construction of the Central Artery on the plot of land between Hudson Street and Federal Street that now houses the I-93 portal. The purple arrow shows the path of Albany Street, which along with Hudson and Utica Streets (and formerly many other streets in the area—more on that in "The West End's Transformation") that were named after Boston and Albany Railroad destinations. Note the South Station Connector—South Station is located about a minute northeast along the Connector by car. All of the buses driving along the Connector are likely headed to the nearby South Station Bus Terminal. 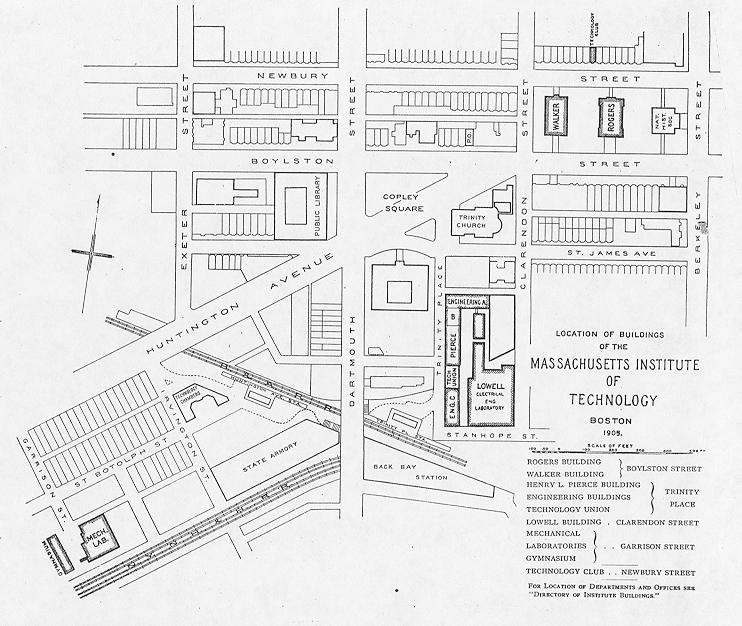 1905 MIT campus map As you can see, MIT's pre-Cambridge campus was focused in and around Copley Square. In the bottom center of the map, off Dartmouth Street, is Back Bay Station on the New York, New Haven and Hartford Railroad's Boston and Providence Division, the predecessor to the modern Southwest Corridor. Just north of Back Bay Station is Trinity Place Station, and to the left of Trinity Place Station is Huntington Avenue Station, both on the Boston and Albany Railroad, along whose former right-of-way the Mass Pike now runs. Map courtesy MIT Archives. Yet despite the grandeur associated with the most prominent institutions that called Copley Square home, a grittier element of Copley Square sat west of Exeter Street. 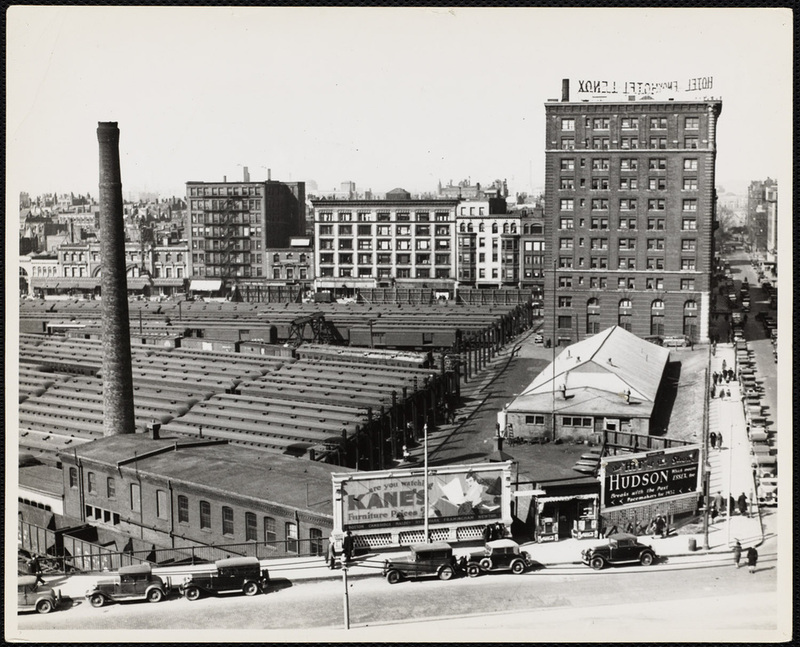 The Boston and Albany Railroad operated a massive train parking and repair facility on acres of land stretching along Boylston Street and Huntington Avenue from Exeter Street to Dalton Street. Huntington Avenue at Exeter Street in around 1930, looking south towards Boylston Street. At right is the Lenox Hotel, one of the most prestigious hotels in Boston to this day. As you can see, hundreds of B & A RR passenger coaches were parked on prime land right in Copley Square. 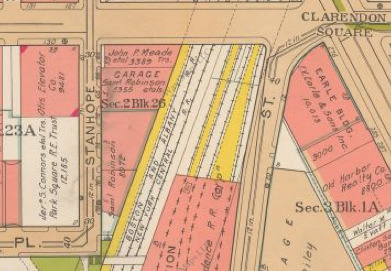 1912 Bromley map showing the eastern half of the old B & A RR yard in Copley Square. At the top is Exeter Street, at left is Boylston Street and at right is Huntington Avenue. Map courtesy Ward Maps. 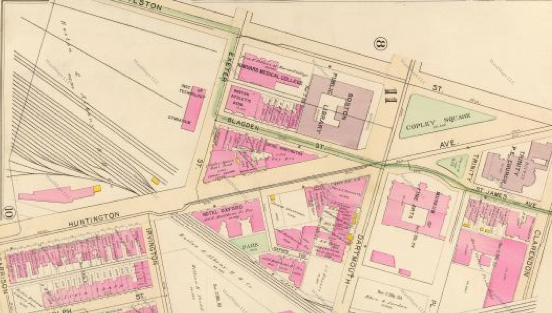 1912 Bromley map showing the western half of the old B & A RR yard in Copley Square. At left is Boylston Street, at right is Huntington Avenue and at the bottom is Dalton Street. Note the Mechanics Building, circled in green. Map courtesy Ward Maps. Naturally, as the years went by and it became clear that Copley Square would remain a prominent location in Boston for years to come, the B & A RR's lot there became a prime target for development. Accordingly, the B & A RR's sale of its Highland Branch to the MTA in 1958 (See "D Branch" Green Line article), eliminating the need for many commuter coaches, heralded a series of changes that were to come to Copley Square in the years to come. In 1960, construction began on the Prudential Center development between Exeter and Dalton Streets, directly on top of the old rail yard. Construction would take four years and would require the demolishing of the Mechanics Building, a prominent Copley Square building since the early 1890s that hosted countless conventions, shows and other special events. 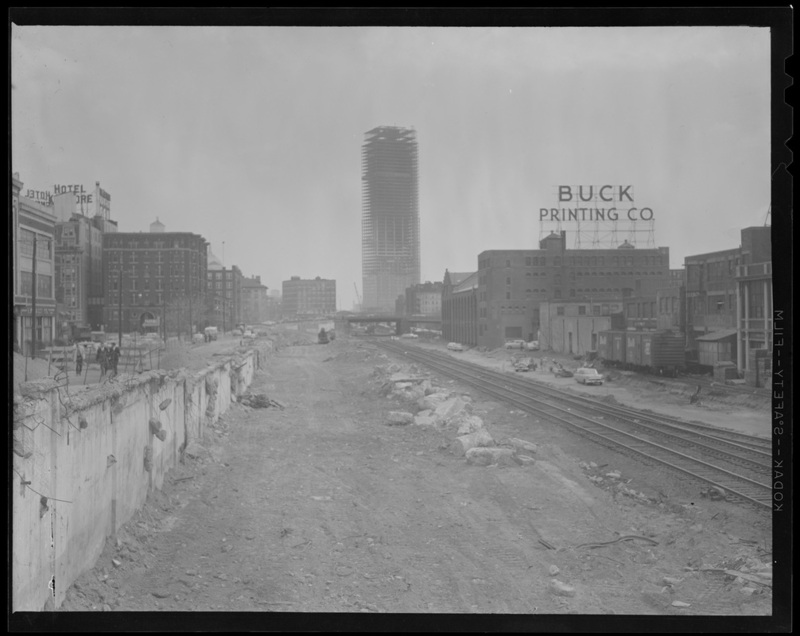 By 1964, the massive rail yard that had sat in Copley Square for over seventy years was gone, replaced with a skyscraper that has since become synonymous with Boston. 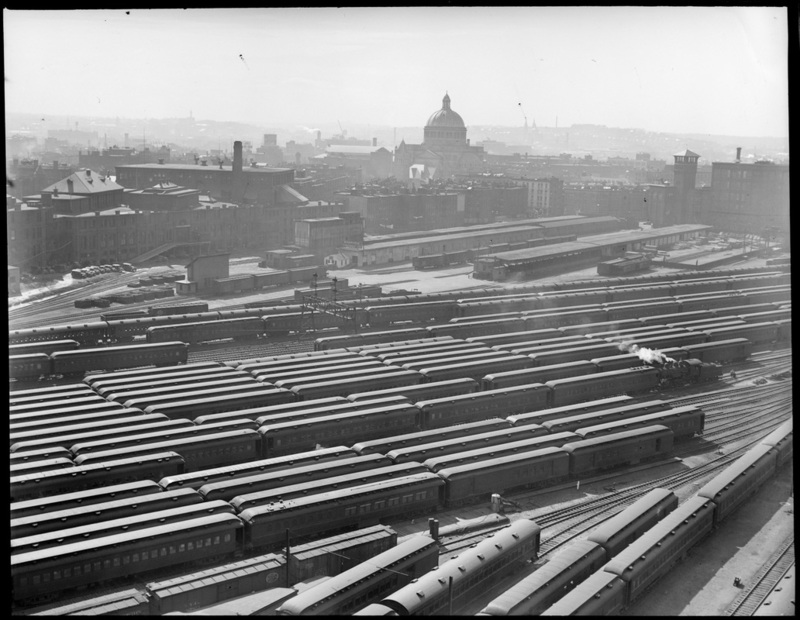 The B & A RR's yard in 1932, looking west towards Brookline, prior to the development of the Prudential Center. The domed building up ahead is Boston's Christian Science Center, and at left is the Mechanics Building, the predecessor to the Prudential Center and a significant landmark in Copley Square covered at greater detail in my "E Branch" article. Image courtesy Boston Public Library. Aerial view of the development that has taken place as of 2013 on the former site of the B & A RR's rail yard. As a reminder, the yard was bounded by Dalton Street, Boylston Street, Exeter Street and Huntington Avenue. By the following year, 1965, construction concluded on the Massachusetts Turnpike, a new highway that now cut straight through Copley Square. The Pike was built along the right-of-way of the Boston and Albany Railroad through downtown Boston; construction involved demolishing virtually all buildings on the westbound side of the right-of-way to widen it and replacing the tracks with traffic lanes. The Pike passes directly under the Prudential Center, carrying millions of cars per day; train tracks were reinstalled on the eastbound side of the Pike and continue to be used today by MBTA commuter trains. 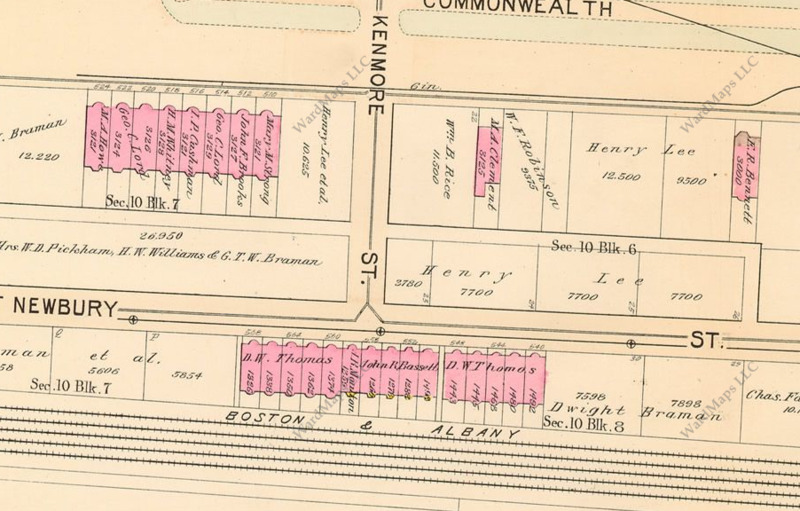 1895 Bromley map showing the area near Kenmore Square that the next two pictures will show. 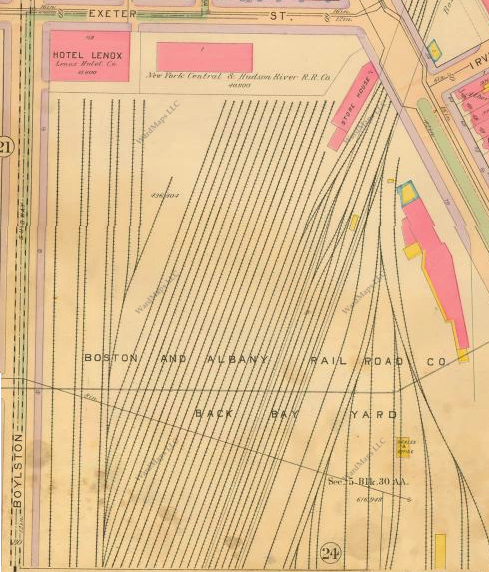 As you can see, the Boston and Albany Railroad's median through Boston ran right where the Pike runs today, sporting five tracks, and buildings lined what was to become the westbound side of the Pike. By 1920, there would have been many more buildings in addition to the ones shown. Map courtesy Ward Maps. Construction of the Pike by Kenmore Square in the early 1960s. The tall building under construction in the distance is the Prudential Center, which will briefly serve as the tallest building in Boston. To its left is the Boston Transit Building, formerly the headquarters of the Boston Elevated Railway (BERy) with Hynes Convention Center (formerly Massachusetts) Station still built below it. At right is the Buck's Printing Building, whose large sign was once a Boston landmark much like the Citgo Sign, also visible from Fenway Park. As you can see, all buildings along what is to become to the westbound side of the Pike have been demolished; sections of their concrete shells are still visible in the photograph above. Prior to their uprooting, five tracks ran across the median in the location pictured. Image courtesy Boston Public Library. Note: the picture of the Pike's construction posted above is also posted in my "Massachusetts Station" article, where I cover the buildings that were once along the westbound side of the Pike (which included Massachusetts Station!) in additional detail. The Pike by Kenmore Square (same location pictured above) today. The traffic lanes of the Pike now run where buildings and train tracks once stood; the tracks have been relocated to the far right. 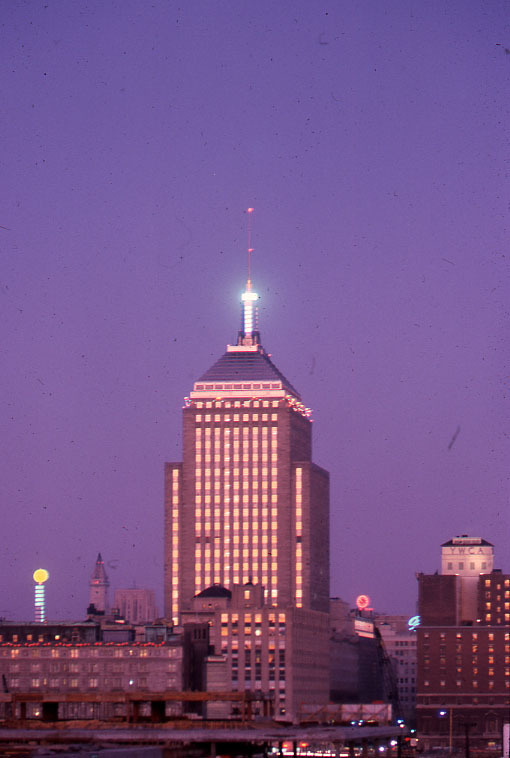 The Prudential Center is now fully constructed, as is the shorter building at its right, 111 Huntington Avenue, which houses the Shops at the Prudential Center and offices. At the Prudential Center's left is the John Hancock Building, the tallest building in Boston as of 1975. Note that the Buck's Printing sign is now gone, replaced by a billboard. Image courtesy Flickr User wallyg. Despite the reconstruction of the B & A RR's median, the Railroad continued to serve South Station and the Financial District until its Boston-serving routes were assumed by Amtrak and the MBTA in the early 1970s. However, the Railroad now stopped at Back Bay Station in Copley Square, as the Pike's construction, by uprooting and relocating the Railroad's tracks, required the demolition of Trinity Place and Huntington Avenue stations. Looking from around Huntington Avenue Station, we see trains passing under Dartmouth Street and through Trinity Place Station in 1964 during the station's last few months of use. Buildings around the track median have already been cleared, and soon the tracks will be removed and the Pike paved. Images copyright Bob Coolidge. Trinity Place Station sat by the intersection of Trinity and Stanhope Streets, whose intersection was demolished to make way for the Pike. The 100 Clarendon Street parking garage built over the Pike sits where the station would have been located. Huntington Avenue Station sat on a plot of land now occupied by Copley Place on Stuart Street. 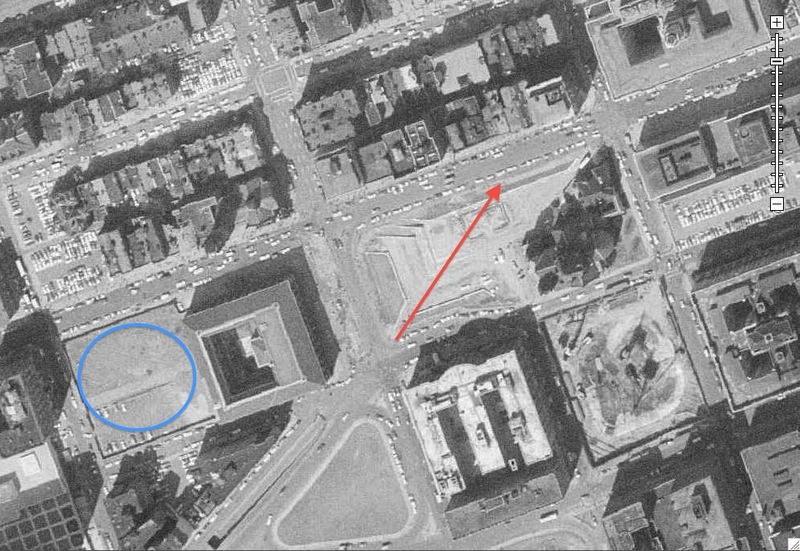 Same 1957 aerial image of Copley Square used at head of page zoomed in on the three train stations that Copley Square once hosted. Circled in red is the westbound Trinity Place Station; at Trinity Place Station's immediate left are the Trinity Court Apartments. At Trinity Place Station's right, circled in green, is Back Bay Station. 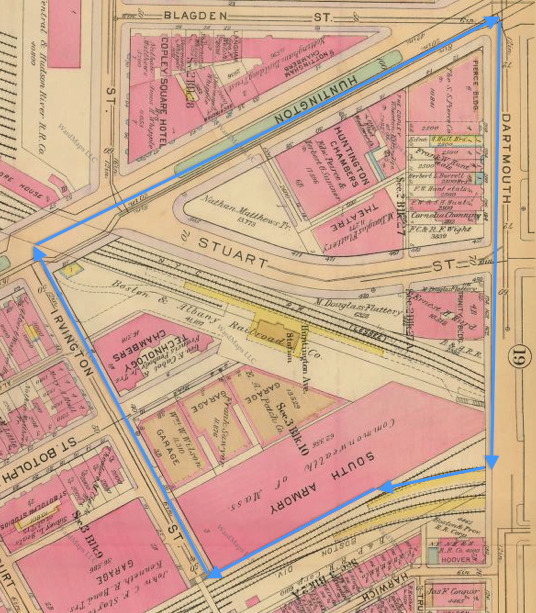 Circled in blue is the eastbound Huntington Avenue Station; at the bottom of the page is Huntington Avenue. 1928 Bromley map showing the former location of Trinity Place Station in Copley Square circled in red. The station was accompanied by a small park and shared its land plot with the Trinity Court Apartments, a Copley Square residential fixture that was demolished to make way for the Pike. Aerial view of the area around Trinity Place Station today. 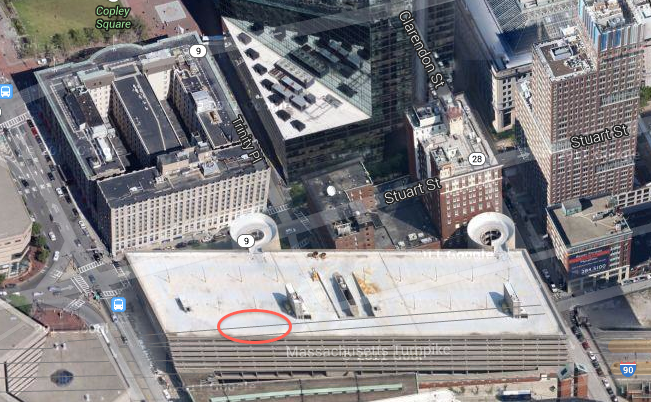 The 100 Clarendon Street parking garage now sits where the station used to be; the station's approximate former location is circled in red. Image courtesy Google Maps. 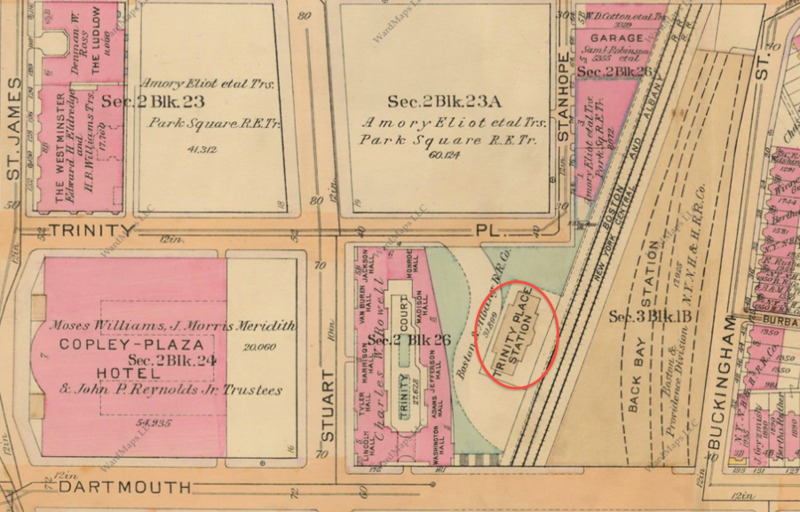 1928 Bromley map showing the former location of Huntington Avenue Station in Copley Square circled in red. Map courtesy Ward Maps. Aerial view of the area around Huntington Avenue Station today. A major building of the Copley Place development, which houses an upscale mall, Marriott hotel, parking garage and offices, is built on top of the Pike and on the former location of the station. Image copyright Google Maps. By the late 1960s, Copley Square had undergone a dramatic transformation. In addition to the Prudential Center development having replaced the Boston and Albany Railroad's yard, the Railroad's tracks were now paved over with hundreds of thousands of private cars passing over them per day. 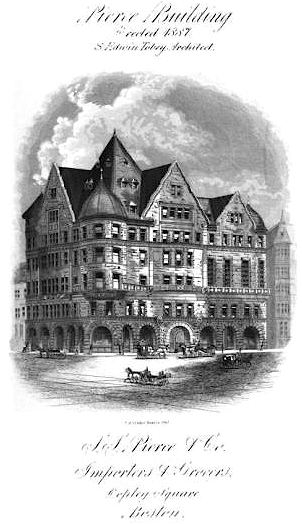 Many of Copley Square's signature buildings were either, in the case of the Mechanics Building, replaced by new real estate, or, in the case of the SS Pierce Company's former headquarters at the corner of Huntington Avenue and Dartmouth Street, demolished to make way for the Pike leaving behind a grassy vacant lot. Copley Square in 1929. 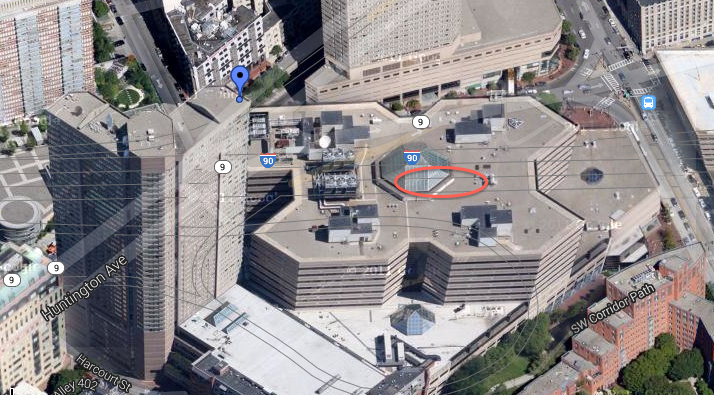 Circled in red is the Boston and Albany Railroad rail yard atop which the Prudential Center development was built. Circled in purple and blue are Trinity Place and Huntington Avenue Stations, respectively. 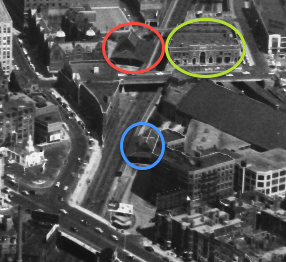 Circled in green is the distinctive headhouse of the Copley Square streetcar subway station, shown earlier in this article. Circled in orange is the SS Pierce Grocery Company's headquarters. 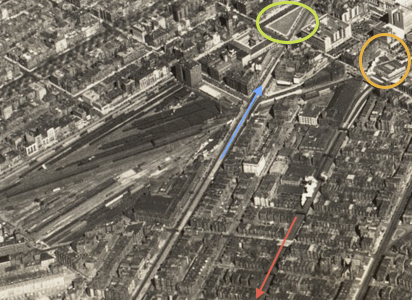 The orange arrow shows Huntington Avenue's former path through Copley Square; at the time, Huntington Avenue intersected Boylston Street. At the tip is the arrow is the end of the Huntington Avenue streetcar reservation used by the predecessor of the E Branch of the Green Line prior to the construction of the Huntington Avenue Subway (see my article "E Branch" for more details). Image courtesy Boston Public Library. 1969 aerial image of Copley Square area, courtesy Boston Redevelopment Authority. 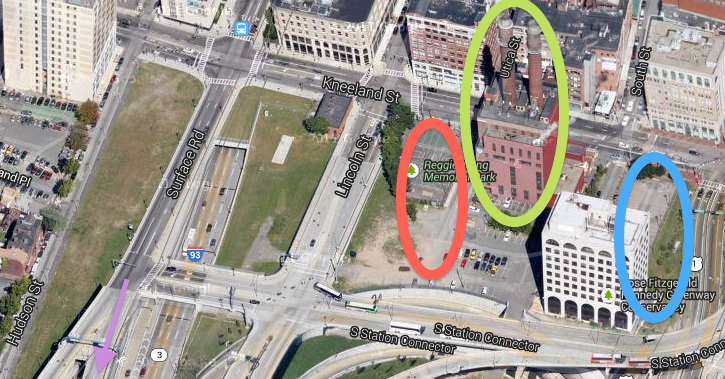 Circled in blue and red are two grassy vacant lots. The red one once hosted Huntington Avenue Station and a US Army armory, as well as a parking garage and an apartment building, Technology Chambers, that once served as an MIT dormitory back when MIT was based in Copley Square (see earlier in this article). Now the lot is mostly occupied by an entrance-exit ramp for the Pike. The blue one once hosted a theater, apartment buildings, more MIT dorms, a hotel and the headquarters of the SS Pierce grocery company, a former mainstay of Boston's grocery economy. 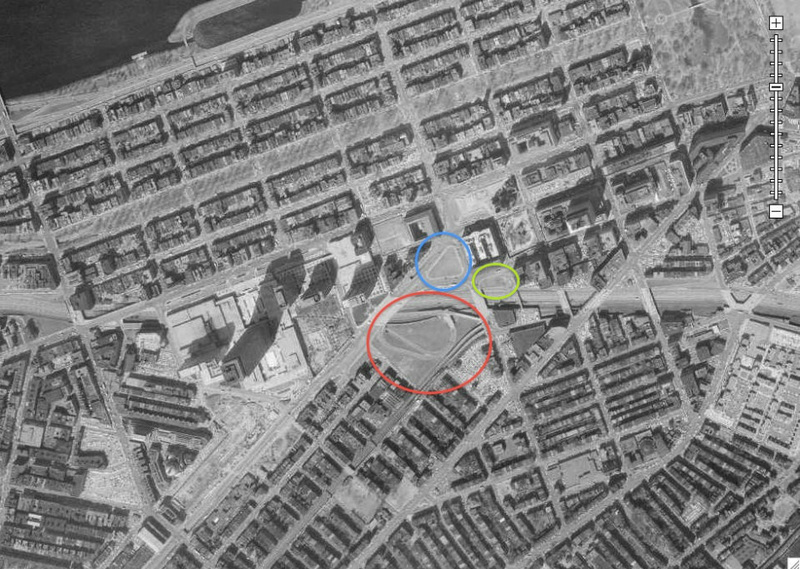 The grassy vacant lot circled in green is the former location of Trinity Place Station of the B & A RR and the Trinity Court apartments; the green-circled lot remained vacant until the construction of the parking garage at 100 Clarnedon Street, which extends over the Pike to connect with Back Bay Station. 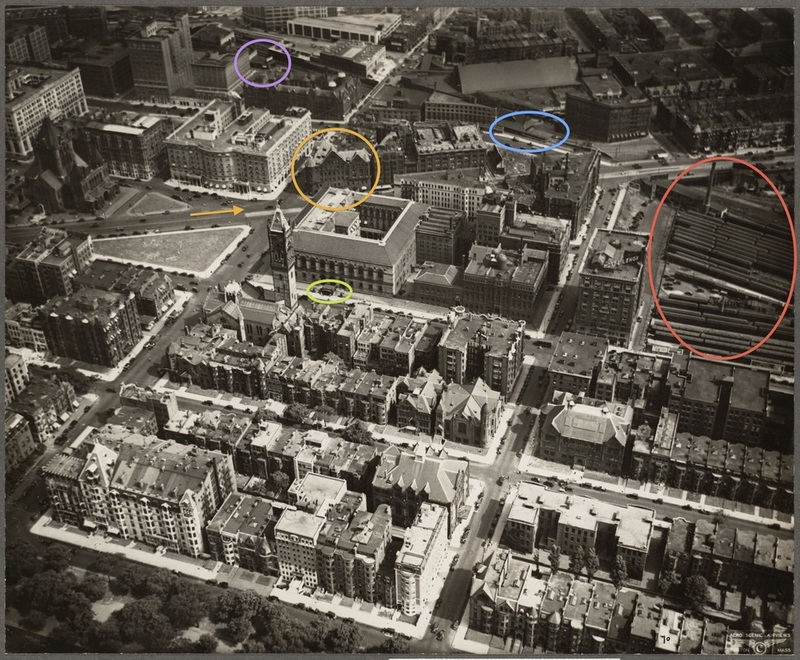 1922 Bromley map showing the buildings that once occupied the area in Copley Square, bordered in blue, that remained vacant for nearly twenty years prior to the construction of Copley Place and is marked with blue and red circles in the aerial photograph shown previously. Map courtesy Ward Maps. Public domain photograph of the headquarters of the SS Pierce grocery company as it stood on the corner of Huntington Avenue and Dartmouth Street until it was demolished in 1958 to make way for the Pike. A similar building, shown below, which served as a branch of the SS Pierce grocery store, still stands today at the corner of Beacon and Harvard Streets in Coolidge Corner in Brookline. The Brookline building is used today to house various small business on its ground floor and offices above. Beacon Street at Harvard Street in Brookline. The building up ahead with the clock tower is the SS Pierce Building, built in 1897, which formerly housed an SS Pierce grocery store. Note that the C Branch of the MBTA's Green Line runs right past; shoppers at SS Pierce evidently utilized the C Branch and route 66, a former trolley line that runs on Harvard Street as a bus perpendicular to the C Branch at this location, to get to and from the SS Pierce store. The street grid of Copley Square had also been altered. As part of the urban renewal efforts in the area, Huntington Avenue no longer intersected Boylston Street; it now ended at its intersection with Dartmouth Street, and a new park stood in the center of Copley Square where Huntington Avenue had once passed. 1957 aerial view of Copley Square showing Hunting Avenue cutting across Copley Square to intersect Boylston Street. At the time, there were two smaller parks located in the center of the Square cut off from one another by Huntington Avenue. Notable landmarks are the old John Hancock Building, an office building which still stands today and at the time was Boston's second-tallest building (after Custom House Tower in the Financial District), circled in green, and the Trinity Court apartments, circled in blue and easily recognizable by their pair of golden turrets and center courtyard, which stool adjacent to Trinity Place Station, whose accompanying small park is visible to the right of the blue circle. Image courtesy MIT Libraries. 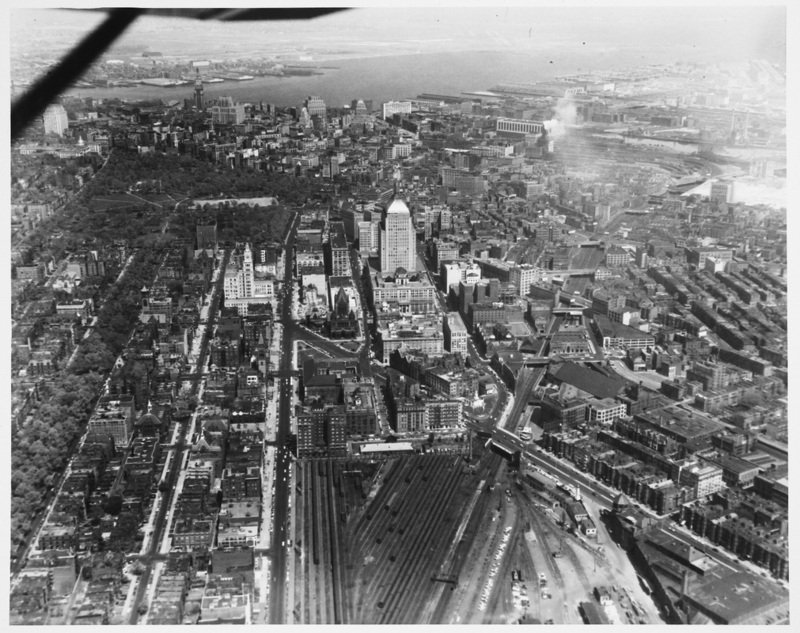 1969 Boston Redevelopment Authority (BRA) aerial photograph of Copley Square. 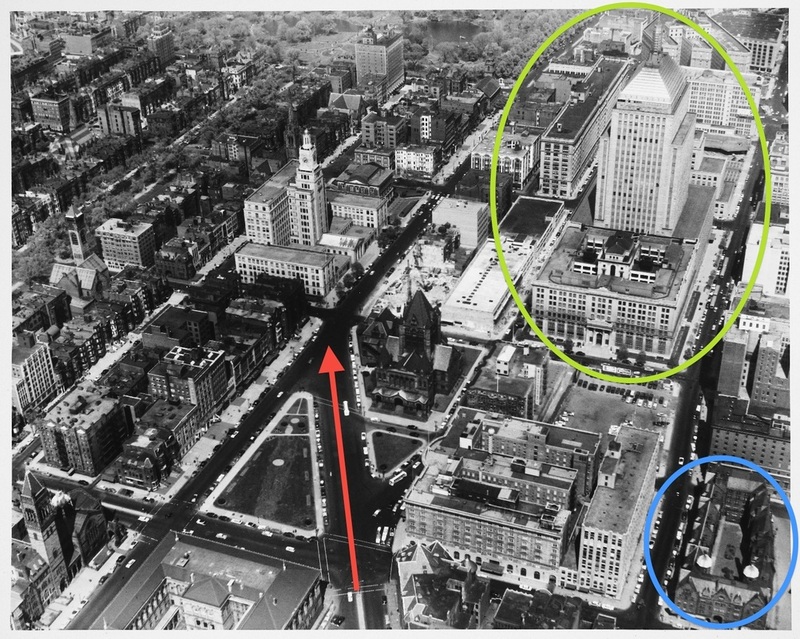 The red arrow shows Huntington Avenue's former path through what is now a park at the center of Copley Square. The new park serves as a public gathering spot and a much-expanded courtyard for Trinity Church, circled in purple, which has long been a Copley Square landmark. Circled in blue is the parking lot onto which the Boston Public Library's 1895 McKim Building will soon be extended as part of an imminent spur of development in Copley Square. Also to be built will be the John Hancock Tower, which will be completed in 1975 and whose footprint is circled in green. Yet even after all of the drastic changes to Copley Square, even more development was to come. In 1975, construction ended on the John Hancock Tower, a gleaming new skyscraper that to this remains the tallest building in Boston. The Hancock Tower complemented the Berkeley Building (also known as the "Old John Hancock Building), circled in green two photographs above, as the John Hancock Insurance Company's headquarters. Copley Square now had three significant skyscrapers, up from one as early as 1960. View of Copley Square skyline through a Cambridgeside fence. At far right is the Prudential Tower, at center is the John Hancock Tower and at far left is the Berkeley Building (Old John Hancock Building). Image courtesy City of Boston Archives. Berkeley Building (Old John Hancock Building) by night. Note the spire topping off the building; this is a weather beacon. The spire shines blue when skies are clear, flashes blue when clouds are expected, shines red when rain is forecasted and flashes red when it is expected to snow. Image courtesy City of Boston Archives. The subsequent major developments in Copley Square were mainly shopping-related with some additional office buildings and hotels. In the early-1980s, the Copley Place development, which has been oft-mentioned over the course of this article, was constructed on the two grassy vacant lots along Huntington Avenue that were cleared to make way for the Pike. Subsequently, in 2002, the Shops at the Prudential Center (otherwise known as 111 Huntington Avenue) were constructed adjacent to the Prudential Tower, bringing Copley Square a gleaming new mall and additional office space above. After the construction of the Pike, the only other significant transit development that affected Copley Square was the construction of the Southwest Corridor, a right-of-way built along the former path of the NY NH & H RR's embankment through downtown, Jamaica Plain and Roxbury originally intended to be used for a highway but later repurposed as a new train right-of-way for MBTA commuter trains and a new path for the MBTA's Orange Line, replacing the Washington Street Elevated, bringing Orange Line service to Copley Square for the first time ever (see "Boston's Cancelled Highways" and "Orange Line" for more information). The effects of the Corridor's construction were most significantly felt in Roxbury, particularly in the Mission Hill and Fort Hill residential neighborhoods which abut the Corridor and lost much of their appeal during the Corridor's construction, and the Jackson Square and Roxbury Crossing commercial districts, which were virtually cleared of their commercial infrastructure to make way for the Corridor and remain studded with vacant lots to this day. However, Copley Square was still influenced by the Corridor's construction, though much more positively. 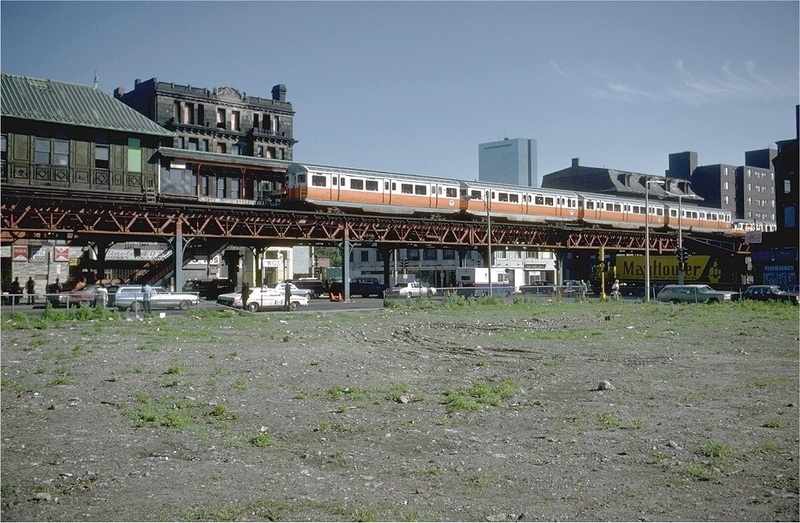 In 1987, a new Back Bay Station opened, this time serving both commuter and Orange Line trains. While a historic station was lost, the new Back Bay Station and the Southwest Corridor brought a convenient new transit option to Copley Square, the Orange Line. 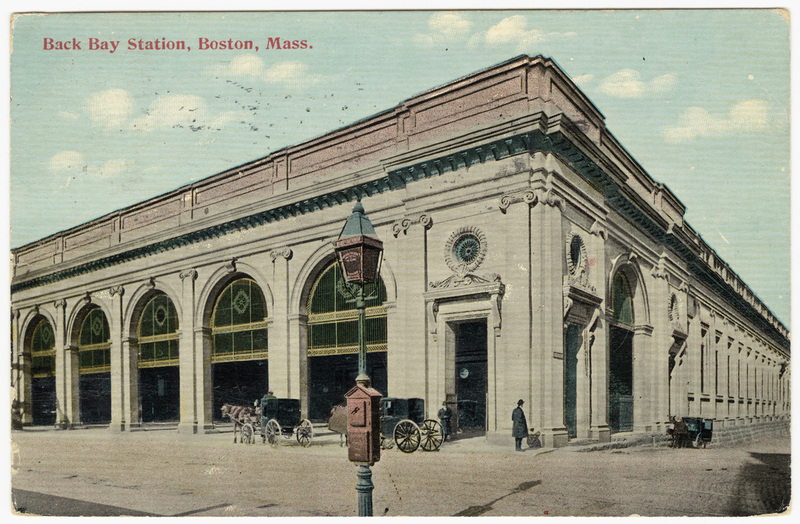 The old Back Bay Station, circa 1910. Note the majestic, intricate architecture of the building. Image courtesy Boston Public Library. 1970 aerial of the Pike and, to the right, the South End. In the foreground is the old Pike exit ramp in Copley Square on top of which Copley Place sits today. 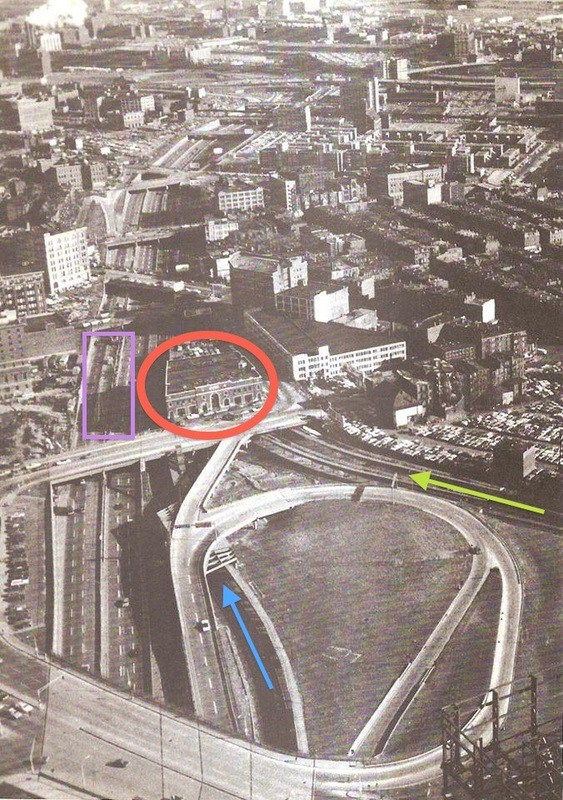 Circled in red is the old Back Bay Station; the purple square denotes the future location of the 100 Clarnedon Garage, which will be built on top of the Pike in the mid-1970s. The blue arrow shows the path of the new Boston and Albany Railroad median along the Pike, and the green arrow shows the still-in-use (for another 17 years) NY NH & H RR median coming from Roxbury. 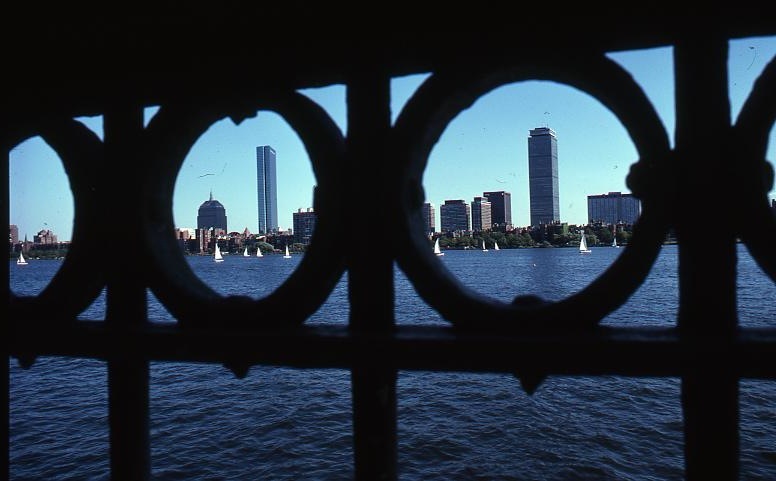 Image copyright Steve McGinn via Dirty Old Boston. 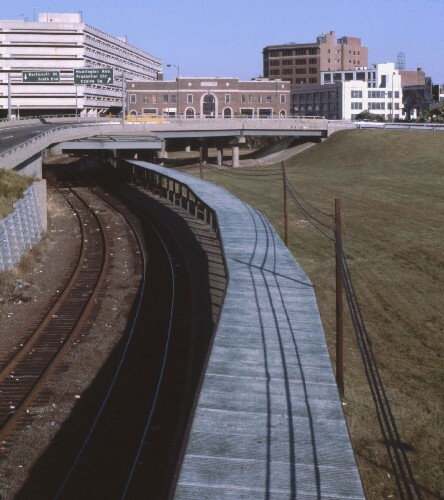 1979 view of the new Boston and Albany Railroad median, by now owned by the MBTA, approaching the old Back Bay Station, the brick building up ahead. By now, the 100 Clarnedon Garage has been built; it is visible to the left of the old Back Bay Station. If you look at the last photo, the photographer of this photo would have been standing just behind the tip of the blue arrow, in the grassy vacant lot occupied by the Pike exit ramp in Copley Square. Image copyright Steve Dunham. The new Back Bay Station, opened in 1987, on Dartmouth Street. Copley Square was most positively affected by the Southwest Corridor's construction in the St. Botolph Street neighborhood, a section of the South End which closely abuts Copley Square and Huntington Avenue. For years, the South End as a whole had been one of Boston's poorest neighborhoods, plagued by rampant decay, overcrowding and crime. 1963 photograph taken from an alley in the St. Botolph Street neighborhood. Up ahead is the under-construction Prudential Tower nearing completion. 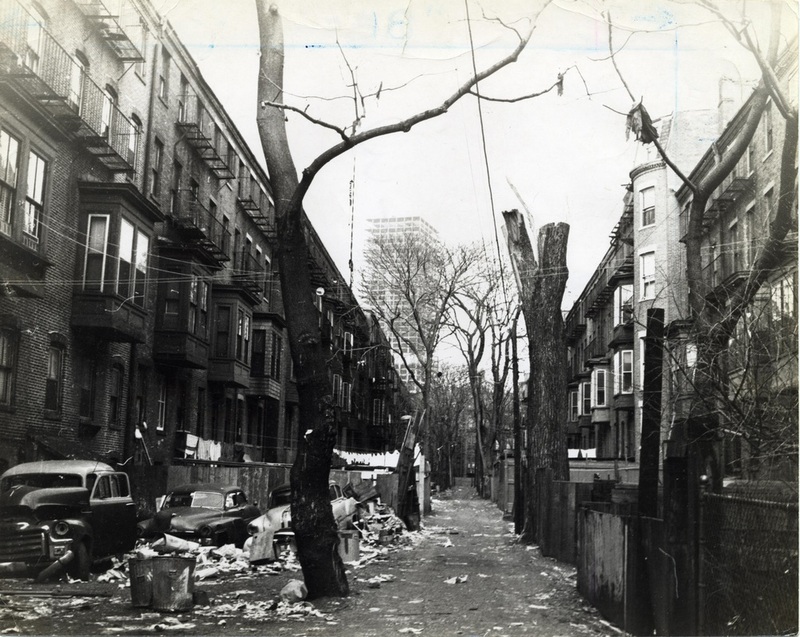 As is evident from the surrounding, the neighborhood is not is very good shape—litter covers the thoroughfare, and piles of garbage line its sides. The construction of the Southwest Corridor dramatically changed the South End. Firstly, the construction of the Corridor and the re-routing of the Orange Line through it meant the end of the Washington Street Elevated, which was torn down promptly with the opening of the new Orange Line. The Elevated had cast a dark shadow upon Washington Street, the South End's main thoroughfare, since 1901, and with the new sunlight shining down onto the Street came a new beginning for the South End, for better or for worse, as the South End became a more desirable place to live. Subsequently, the South End experienced significant real estate development and accordingly gentrification. The area around Northampton Station on the El in the South End in 1979. Buildings have a run-down appearance, and the block on Washington Street is dominated by a large vacant lot. In the distance is the John Hancock Tower, completed just four years previously. Image copyright Joe Testagrose. Washington Street in the South End at the former location of Northampton Station today. The vacant lot shown in the previous photograph now hosts a sparkling new real estate development, and the older buildings have been beautifully restored. On the right is a Silver Line bus; the Silver Line Bus Rapid Transit system is the replacement for the Washington Street Elevated in the South End. Even before the area of the South End around Washington Street began to gentrify, the St. Botolph Street neighborhood experienced gentrification with the opening of Southwest Corridor Park in 1987. Where there once was a railroad median now ran a sparkling new linear park, built on top of the new Southwest Corridor, lush with grass, walking/biking paths and community gardens. With a fresh new park replacing train tracks perceived as noisy and dirty, yet efficient trains still running through the neighborhood and providing residents with convenient public transit access, as well as the neighborhood's proximity to Copley Square, the St. Botolph Street quickly became the highly-desirable district is is today. 1930 aerial view of the St. Botolph Street neighborhood, located between the blue arrow, which denotes Huntington Avenue, and the red arrow, which denotes the old NY NH & H RR median running through the neighborhood. Circled in orange are Back Bay (NY NH & H RR) and Trinity Place (B & A RR) stations, and circled in green is the old park at the center of Copley Square and what was then the intersection of Huntington Avenue and Boylston Street. Image courtesy Boston Public Library. Southwest Corridor Park, with (left to right) the Prudential Center, Copley Place, the John Hancock Tower, the Berkeley Building and a new residential high rise, One Back Bay, located on Clarnedon Street towards Copley Square from the Garage at 100 Clarnedon. Yet with all of these changes, Copley Square remains much the same as it has always has been; it has simply been kept up with the times. Copley Square's institutions remain among the most prestigious and emblematic in Boston, from intellectual institutions like the Boston Public Library to classic grand hotels such as the Copley Square Hotel, Copley Plaza Hotel and Lenox Hotel. Many classic Copley Square buildings still remain—the Boston Public Library's McKim Building for one, as well as the Boston Society of Natural History's (now the Boston Museum of Science) former headquarters and all three John Hancock Buildings, as well as Trinity and Old South Churches and many more. Boylston Street in 1900, already laden with the high traffic that would later necessitate the construction of the Huntington Avenue Subway (see my "E Branch" article). 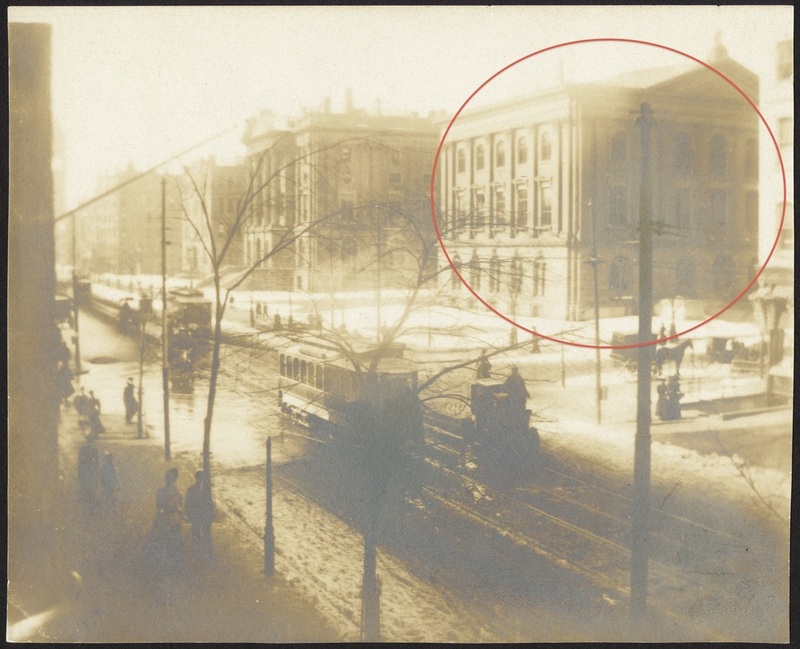 Circled in red is the building which at the time housed the Boston Society of Natural History. The building remains in the same exact location today and, following its sale in the late 1940s, housed a branch of the department store Bonwit-Teller and Company until Louis Boston moved in in 1989. Louis Boston moved in 2010 to the Innovation (Seaport) District, and the building presently houses a Restoration Hardware (RH) furniture store. The original John Hancock Building, renamed the Stephen L.. Brown Building in 2001, in Copley Square. The Brown Building was completed in 1922 and continues to be owned by John Hancock to this day, even after the completion of the Berkeley Building in 1947 and the John Hancock Tower in 1975. What Copley Square lost to urban renewal was quickly returned—the Mechanics Building gave way to the Prudential Center and the nearby Hynes Convention Center (opened in 1988 further down Boylston Street by the corner of Boylston and Dalton, next to Massachusetts Station), the SS Pierce grocery headquarters gave way to Copley Place, the Trinity Court apartments gave way to high rises such as One Back Bay, the old park by Boylston and Huntington gave way to a new one, and so on and so forth. Very few vacant lots remain along the Pike in Copley Square; with their prime location, almost all have been re-developed or are now being redeveloped with fresh infrastructure. Vacant lot by Stanhope Street in Copley Square. To the left is the Pike, and up ahead is the 100 Clarnedon Garage. The Google Street View shown here is out of date; in 2013, a new park, Frieda Garcia Park, opened on this lot. However, the Pike's construction left it vacant for over forty years. 1938 Bromley map showing buildings on the lot above, between Stanhope Street and the old B & A RR right-of-way where the Pike now runs. These buildings were demolished to make way for the Pike, and the lot sat vacant for almost forty years before its redevelopment. Map courtesy Ward Maps. Even Copley Square's transit options remain roughly the same, albeit with some significant changes to better address modern trends. Streetcars still stop in Copley Square as they have for one hundred and fifty years, dating back to horsecars, at the same subway station they have stopped at since 1914. Routes once operated the the Boston and Albany & New York, New Haven and Hartford railroads still run through and stop in Copley Square, albeit operated by different companies—the MBTA and Amtrak—and on significantly modified infrastructure—the railroad tracks on the side of the Mass Pike as opposed to the full B & A RR right-of-way that traversed the same route, and the Southwest Corridor as opposed to the old NY NH & H RR right-of-way and embankment that ran through the St. Botolph Street neighborhood and Roxbury. On a local level, the B & A RR's Highland Branch commuter railroad that served Brookline, Newton and Weston still runs today as a streetcar line, the D Branch of the T's Green Line, and serves Copley Square just as it used to, though it stops in the streetcar subway station as opposed to at Trinity Place. The rest of the trains that pass through Copley today, including the new Orange Line, stop at the new Back Bay Station, which opened in 1987. Quite literally, much of old Copley Square remains concealed under the new. When the Prudential Center was built on the site of the Boston and Albany Railroad's old yard in Copley Square, the tracks were never removed; rather, the buildings and roads were built on top of them. To this day, expansion joints remain in the street throughout the Prudential Center development to hold the road together and ensure that the pavement does not break apart and infrastructure does not shift as the tracks below, which are sensitive to changing temperatures, contract and expand with Boston's fluctuating climate. Ring Road in Copley Square, which cuts across the Prudential Center to connect Boylston Street and Huntington Avenue. The tracks in the street visible above are expansion joints, which keep the street from breaking apart as the train tracks below expand and contract as the seasons progress. 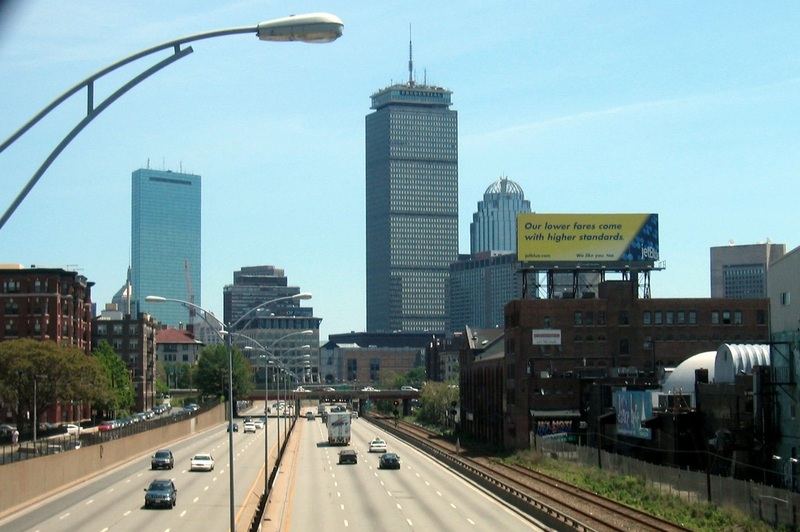 While the construction of the Mass Pike and the Prudential Center destroyed several significant parts of Boston's infrastructure, their construction created a vital artery for Boston that brought the city up to date transportation wise and made the city significantly better equipped to handle car traffic, as well as a hub of public shopping and dining in Boston that satisfied a growing demand for office space, hotel rooms and general entertainment. Driving through Boston would have been a nightmare today had the Pike had not been constructed, as the major streets leading to downtown (Huntington, Boylston, Commonwealth, etc.) date back to when streetcars ruled Boston's streets and cars were exclusive to the upper classes and accordingly can get extremely congested with car traffic. While Copley Square has undergone significant change over the years, much of the old remains and is well complemented by the new. Which is what makes Copley Square an epitome of Boston. One need only take a walk through the Back Bay, the South End, Beacon Hill, the Fenway and much of Dorchester and Mattapan, or compare these districts to an old Bromley map, to see just how much original real estate has been preserved and how consistent much of the layout of Boston has remained over the years. Yet even so, new developments, particularly real estate in the South End, have arisen over the years that are consistent with the city's original architecture and satisfy the growing demand for real estate and other urban resources in Boston, all of which goes to show that like Copley Square, Boston as a whole is a city that stays up to the times not only by starting from scratch, but by preserving existing historical infrastructure and bringing it in line with the present, ensuring that Boston's rich history will remain for years to come.